As the new working year is underway, most of us are back at our desks having replaced swimmers and thongs for business suits and high heels (usually one or the other). So what does 2016 have in store? 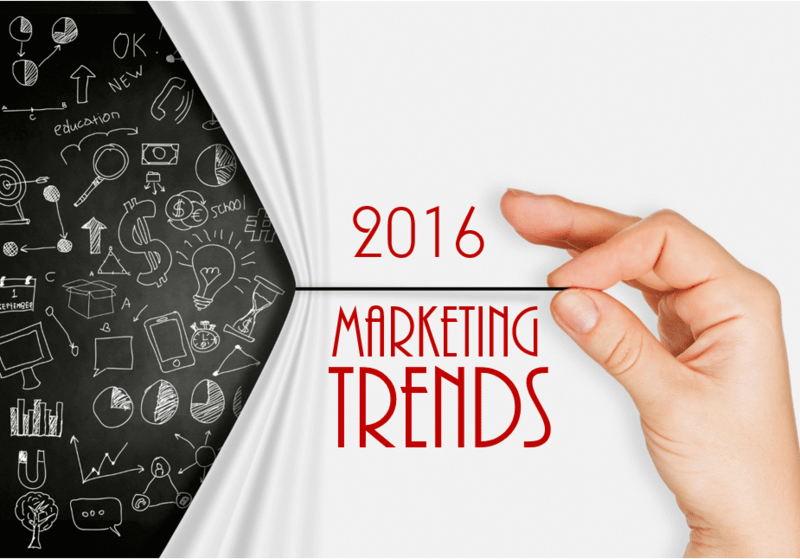 I’ve compiled a list of the marketing trends that will shape 2016. It’s going to be another big year for the industry! 2015 saw the rise of customer experience. In 2016 CX will be huge and it’s here to stay. It doesn’t matter what industry you’re working in, the key to growth is happy customers. It’s become a cliché but brands who genuinely put their customers at the heart of everything they do are far more likely to succeed and grow. The thing is, you actually have to do it not just say you’re doing it. Consumers these days are far too savvy to not see through insincere claims of customer centricity and with the help of social media they’re more than happy to express their disappointment. So not before time, in my opinion, CX has become a tangible part of marketing. When traditionally branded Direct Marketing Agencies are re-branding themselves as CX Agencies, it indicates more than just a passing trend. For now, it gets the top spot on my list. You didn’t read that wrong. Nor is it a typo and no I haven’t lost my mind. Let me explain. In 2016, we’ve reached a pinnacle where digital marketing has become so ubiquitous we actually no longer need to separate it from “marketing”. Digital marketing activities should be fully integrated and simply a part of marketing and the customer experience. Some have termed this a “post-digital” marketing age. While I understand the sentiment I find this label wholly confusing. I support the concept that digital is now so completely and irreversibly integrated into marketing it no longer needs referring to as its own entity. In turn, marketing departments should no longer be structured into “digital” and “above the line” or even “through-the line” teams. There are no lines anymore! But “post digital marketing”? Our entire world is digital! With the rise of CX comes the death of the linear customer journey. 2016 will be the year of brand experience. Linear customer journeys are evolving into multi-staged experiences. It’s no longer enough that brands personalise a linear customer journey nor that they enable “channel of choice”. While these are still important they have become givens in many industries and consumers expect more. Customer journeys will evolve from a linear model to a dynamic brand experience that is as individual as each customer. Innovative brands will empower their customers to shape their own journey across each and every chosen touch point. At the start of 2015, marketers wanted to know which social media platform they should be investing in. A year on and marketers need to be gleaning insights on how people are using these platforms (rather than only looking at which platforms are the most popular) and consider how these insights correlate to their own brand objectives. Although social media platforms provide mass broadcast opportunity they are a highly personal space which means generic messages seem out of place and intrusive. If marketers glean insights on how users are behaving on various social media platforms they can tailor messages accordingly. This may only be subtly different creative executions, personalised based on their posts, searches or interests. Your competitors will likely be spending more on Social Media ads in 2016. However, it’s not simply a case of throwing more money at social to get ahead. For me it’s about being smarter and increasing relevancy to get results. In 2015 video content dominated the social media landscape, driven by the launch of live streaming tools like Facebook’s Livestream and Periscope. Not forgetting the powerhouse that is YouTube. The video publishing platform rakes in more than four billion views per day, it’s the second most popular search engine in the world and the third most visited website (pipped to the post by Google and Facebook of course). Video content will become even more dominant in the coming year. In 2016, traffic will continue to shift away from traditional blog posts, diverted instead to YouTube channels and dedicated video blogs. But it won’t always be about diverting traffic to branded video channels. Web designers will integrate video into design for desktop and mobile sites, making pages less static and more engaging. Videos on home pages and product pages will become increasingly common. Who wants to read through a page of copy when you can watch a 30 second video instead? This shift is significant and content creation and design teams will be re-tasked accordingly. If you’re not already producing branded video content, jump on the bandwagon. Right now. We know that consumer’s inboxes are cluttered which means it’s tougher than ever before to get cut-through of messaging via email. That said email is far from dead, it’s very much alive in 2016. In a recent US survey, 72% of consumers indicated that email is their preferred communications channel (MarketingSherpa, 2015). It’s still the channel of choice for many consumers who prefer to receive offers, updates, bills, statements and notifications directly to their inbox. In the B2B world, the stats vary depending on the source but upwards of 80% of B2B marketers are still using email marketing such as newsletters to deliver relevant content to their audience; Blue Star Direct included. There are three simple reasons for this. If you understand your customers then you’ll know for whom email is a preferred channel which means you’re talking to them on their terms, they’ll already be more receptive to your message because of this. Secondly, email is highly measureable and finally (of course) it’s cost effective. Used correctly, it’s certainly not the time to start dismissing the power of email in your marketing mix. Give it at least twenty years or so.